It seemed something like fate that on my first day driving up the coast of Maine I stumble upon the state’s most prized lobster shack. 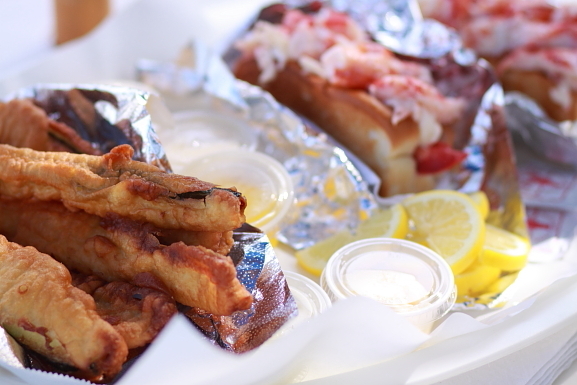 Who would have thought that a tiny candy-stripe hut propped up next to a bustling and under construction Route 1 would deliver the most bountiful fresh lobster rolls – many claim – in the world. 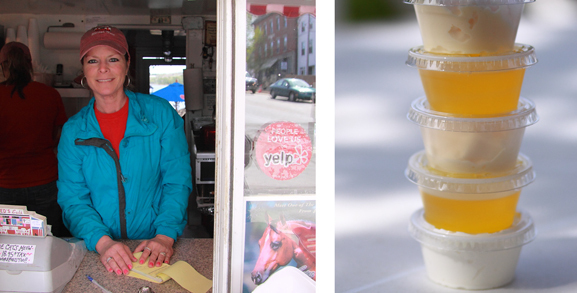 Red’s Eats has been an institution for Mainers since it first opened its doors in 1938 in Booth Bay. Since that time, it has moved to its current location and been taken over by local Debbie Cronk, who greets me with a gushing smile and smooth New England drawl. She exudes the loving care of a mother who just wants to give you a nice, home-cooked meal – so instantly I know I’m going to be fed well. My eating companion and Maine local, B, orders up two lobster rolls but, in our feeble attempt to stick to a healthy diet, we turn down the fried zucchini. “Oh but they’re famous,” chirp two wrinkled beauties standing behind me in line (evidently long-time devotees), and Debbie insists, “They really are special.” With that, she loads up my tray with a freshly fried batch. “I just really wanted you to try them,” she says and I feel the motherly pull on my heart strings again. 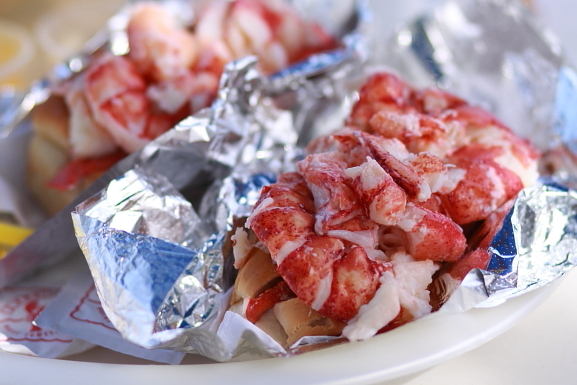 But I know you want to hear about the lobster roll. This thing really is mammoth – nearly 1 ½ vermilion bugs piled into a perfectly toasted hot dog bun, served up with pots of warm drawn butter – poured straight from the kettle by Debbie herself – mayonnaise and lemon wedges. It’s up to you to slather on the condiments to your satisfaction before attempting to wrap your lips around the meaty handful. To be honest, my first attempt was unsuccessful. These lobster rolls are just so voluminous that initial pruning is required to trim the beast down to a manageable size. This does, however, allow you to savour each butter-slathered hunk of lobster one at a time. Once you do, it’s just a matter of discipline to hold yourself back from inhaling it. 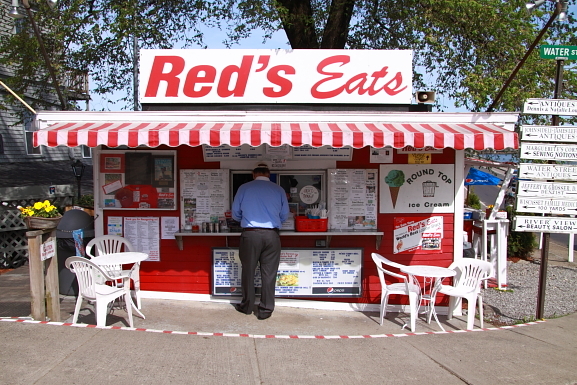 We were lucky to enjoy a sparsely populated deck behind Red’s Eats that afternoon, but be warned: this place packs out over summer, drawing a snaking queue of customers – on foot and by car – so expect a slow-moving pilgrimage. At the end of a long wait though, you can look forward to Debbie’s cheery smile and the promise of Maine’s best home cooking. WOW! I need one of those NOW!